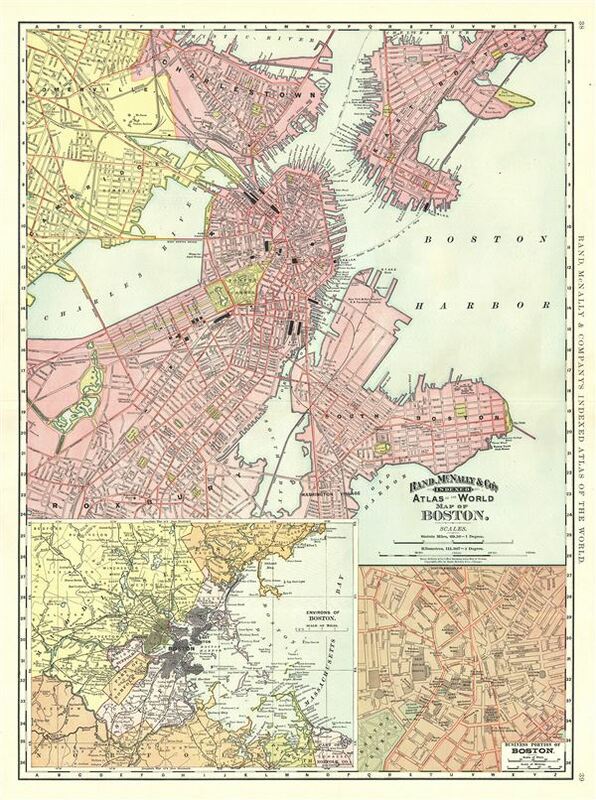 This is a beautiful 1891 Rand McNally and Company's map or plan of the city of Boston, Massachusetts. It covers the city from Charlestown and Somerville to Roxbury and Washington Village in the south. Two inset maps along the bottom margin detail the Environs of Boston and business portion of Boston. This highly detailed map notes several parks, piers, railway and ferry lines, and other topographical features. Individual streets and buildings are identified, including courts, museums, insane asylums, etc. This map was issued as plate nos. 38 and 39 in the 1893 edition of Rand McNally and Company's Indexed Atlas of the World- possibly the finest atlas Rand McNally ever issued. Rumsey 3565.071 (1897 edition). Philips (atlases) 1026 (1898 edition).